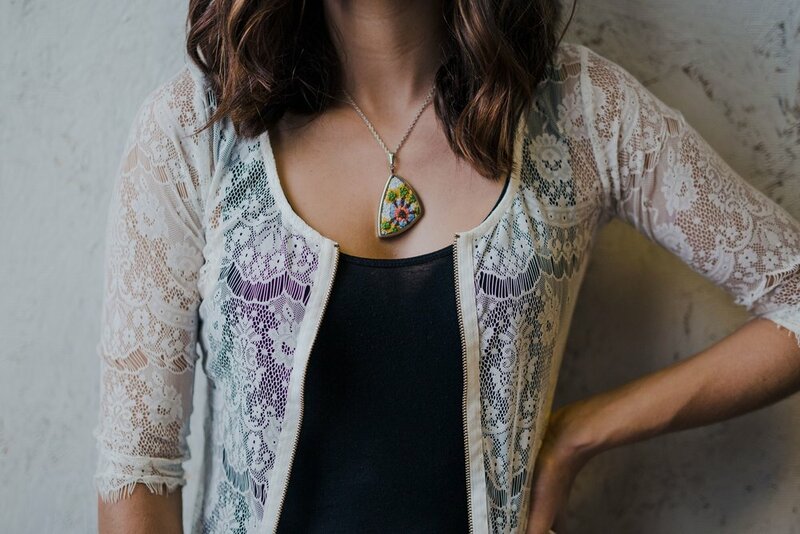 Embroidered Pendants that make a statement. Each intricate piece is created with careful consideration. Merry starts with the basic shape of each pendant and creates an interesting line composition that suits that particular shape. Building a unique color palette for each pendant is one of Merry's favorite processes. Drawing inspiration from nature, each color palette is carefully determined by placing the embroidery floss side by side until a pleasing palette is reached. Some pendant designs use nine colors or more in the tiny space. The stitching begins. The stitching doesn't start with much of a plan. It is an intuitive process. Merry picks through the color palette, selecting different colors for different areas of the stitching. As she works across the small surface, each stitch is valued and important for its role in making up these rich textured pieces. This process can take up to two hours as Merry gets lost in the joy of embroidery floss passing through taut fabric. Merry has been an artist her entire life. Her love of fiber arts started as a third grader when she learned to crochet from her mother. Her interest grew as she began sewing in her grandmother's basement. Her experiences as a young girl led to a career in fiber arts. She earned her BFA in sculpture from Wright State University, studying under the guidance of Thomas Macaulay. Merry has created works in fiber that have been exhibited at the Dayton Art Institute as well as the Ohio Craft Museum. This site is dedicated to a line of embroidered pendants that are a labor of love for Merry. Enjoy these rich textured pieces and acquire one for your collection.